Touch Ahead Software, LLC announced that EquityTouch was chosen as the Premier CRM Sponsor of the 4th Annual VCPE Conference & Retreat. This year’s VCPE Conference will be held in Miami, Florida, from March 24th – 27th, 2009. Representatives from Touch Ahead will be on-site to speak about the SaaS (Software as a Service) model and the positive ROI. 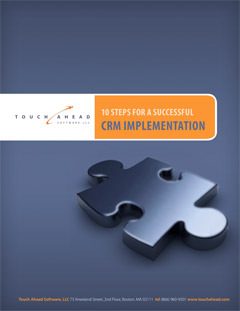 Touch Ahead will also demonstrate its hosted CRM solution, EquityTouch, which has been in development since 2008. EquityTouch is a cutting-edge SaaS-based CRM solution for the alternative investment community. EquityTouch makes it possible for you to manage business relationships intelligently. EquityTouch prides itself on being the fastest, easiest to use web application delivering the most relevant features in a completely customizable interface.